I made moussaka for dinner last night. The recipe comes from a dear friend who is quite the cook. A lot of years ago, she taught several of us how to make spanakopita, tzatziki and she had prepared moussaka and shared the recipe with us. I made it in ABQ but it wasn't a hit with my family. I thought the kids have matured with their tastes and I would give it a go again. My husband doesn't remember it the first time around and tells me he must have been TDY. I have one kid that doesn't eat red meat, of the three left, the twins liked it and my son didn't give it a fair try. A recipe I enjoy but it will sit and be dusted off again in a few years. The twins are turning 12 this week. One of them loves One Direction. She has many posters on her wall of them, group and single pictures. She has a spot reserved for one that she wants but doesn't have. Her sister, while she likes One Direction, is into Bruno Mars and Maroon 5 but she agreed to go with a One Direction theme for the party. Yay! Still working out some details of activities and I haven't given a thought to the cake but I thought I'd share the invite. I found several through Google images. I took what I like from at least 2, perhaps all 3 of the ticket style invitations and created one for them. I hear their friends thought they were cool and one of the friends hung hers on the wall. Off to a good start for this event. Congratulations Kathy! I've already sent you an e-mail requesting your address! Kathy StacyCollapse Wasn't sure if we leave the comment here or on yesterdays - so I'm covering my bases :) Thanks for the chance to win. I hope you have seen many great things. I'm glad you stopped by my blog! I was going to shoot for a winter theme with this hop but it was 90 degrees here today and that just isn't going to work for me. I went with a Christmas card using one of the sentiments that you might win if you leave a comment. See my post from Friday for details, or just leave a comment and you are automatically entered. I used Sketch Challenge 128 from OWH for this card. I flipped it around so I could use the ornament set. I had to make the banner slightly larger (7/8") and cut off some of the swirly to make it fit. Have fun hopping! Click OWHto get back to the hop. 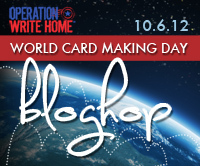 Tomorrow is World Card Making Day. I'm participating in a hop with Operation Write Home and will have a prize for a lucky commenter. To enter, come visit tomorrow and leave me a comment. 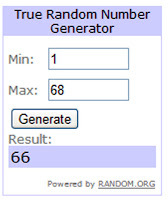 I will use random.org to select a winner from the comments. I will contact you via e-mail for your address on Monday and will post the winner here for all to see. What is the prize you ask. A very timely clear mounted stamp set from Stampin' Up! Come back tomorrow, leave a comment and check out the hop. This little guy has had a rough couple of months. First he ate some carpet or bedspread with the people that took care of him while we were away getting a mass in his stomach. That required several medicines and about 6 weeks of trips to the vet for weigh-ins to be sure he was gaining weight. Last week he had an abscess tooth. They saved the tooth by filing it and removed the abscess. Once again, he has an antibiotic. He was dubbed a "honey bunny" at the vet when we went to pick him up from having the packing removed. We have to put honey into the opening once a day and let it drain. Honey being a natural remedy for the bacteria to bring it out and not allow it to grow inside for infection. I almost feel like he is a guinea pig for this procedure but this office has been so good and attentive with him I just have to trust they know what they are doing. I'm surprised he can eat like he does.